We saw a large opportunity in exploring an alternative gaming method that is both spatially immersive and challenging the body with a new sensory experience. 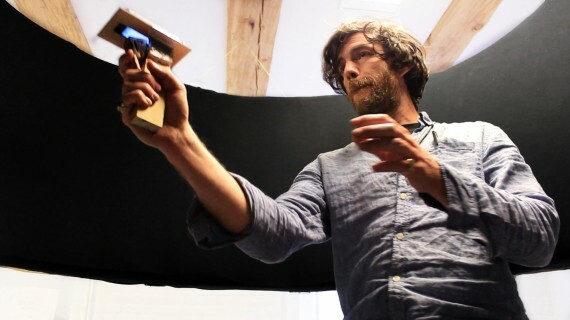 Blind Duck Hunt is an exploration into spatial sound and the future connectivity of devices. Current video game experiences are commonly made through screen-based interactions, with more emphasis on the visual graphic representation of the gaming environment. Our new take on the classic Nintendo game “Duck Hunt” takes advantage of our abilities as humans to visualize, understand and react to space through audio. Blind Duck Hunt recaptures the magic we have in many shooting games of wireless contact and translates it into a full body experience in an immersive environment. Today, we can use a multitude of our own day to day devices to play games, and our project takes advantage of new possibilities in web technology to create a three dimensional soundscape of ducks with four speakers, and a “gun” with a smartphone. With ducks creeping up from behind, keep your ears open and gun close. Video games have opened the doors for new social experiences with technology. Nintendo’s classic game “Duck Hunt” is well known by most people due to its simple rules, great visuals, and easy accessibility for people of any age and demographic. In the original game, a duck flies across the screen and you aim and shoot with a gun controller. In our version we recognized this level of accessibility, and wanted to also increase the social potential of the game as well. By having an extremely simple interface, our game requires no previous gaming experience, lowering the barrier to new and non gamers, young or old. The formal qualities was specifically crafted to enhance social interaction. During our process we tested and calibrated the sound space with numerous people, discovering new opportunities along the way that helped shape our final installation. Blind Duck Hunt can be seen in contexts like museums, science fairs and art/music festivals. The final outcome was an exhibition where we gave the audience the “gun” and let them approach the “sound cylinder” with little instruction. We suspended the structure so those on the outside of the cylinder could also engage with the game. This was done through screens to allow people to see and hear how well the participant was doing. The low entry barrier made the game extremely accessible to anyone, and the simple rotate & shoot interaction was quickly learned by those observing. The installation also sparked fun and unexpected social behaviour between attendees, including co-operative gameplay. The sound cylinder was large enough to accommodate three or four people in the middle to listen for the ducks together. The ability for multiple devices to be connected and to drive the input and output of the game logic itself meant that one player could possibly control the location of the duck while another player was inside the cylinder. By limiting sensory inputs to hearing, the game also offered an experience that provoked visitors to imagine other opportunities in gaming not limited to just Duck Hunt. Throughout the exhibition the game generated stimulating discussions around the future of technology and interaction. As this was an explorative project, our final prototype was made with materials typically used in rapid prototyping. Blind Duck Hunt consists mainly of two objects: the sound cylinder and the gun controller. The sound cylinder needed to be durable but lightweight. This led us to use foam core for the main structure with plywood reinforcements. The main speaker surface was created with cardstock and lightweight stretchable fabric. The structure was purposely hung at head level, making it easy to enter and leave without feeling completely isolated. The suspended form also made the experience fun and very inviting for people watching. The gun controller was made to hold any mobile device running the Duck Hunt web app. The phone’s gyroscope provided direction data, while the gun trigger was connected mechanically with a trigger wrapped in conductive tape to tap the screen on press. To finalize the connectivity, data was sent through a Processing app which hosted the game logic. 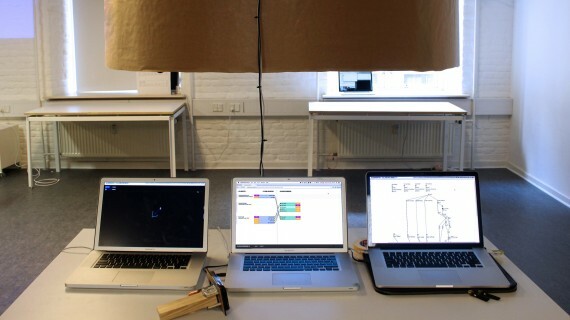 From here, the app communicated to two computers running Pure Data to map the sounds of ambience, ducks and gunshots. Spacebrew provided the web socket magic to connect all inputs, devices and applications together.